CHICAGO--(BUSINESS WIRE)--Jun. 11, 2014-- Hyatt Hotels Corporation (NYSE: H) announced today the official opening of Andaz Tokyo Toranomon Hills, the first Andaz hotel in Japan and the twelfth Andaz hotel globally. The hotel is a significant addition to Hyatt’s growing portfolio in Tokyo, joining Park Hyatt Tokyo, Grand Hyatt Tokyo and Hyatt Regency Tokyo. Andaz Tokyo Toranomon Hills is located in the 52-story Toranomon Hills tower from floors 47-52, a progressive multi-use high-rise for high-end business and lifestyle that will look to position Tokyo as an internationally competitive world class city. Located between the Tokyo Tower and Imperial Palace, the hotel offers easy access to key locations and sites, including the Ginza shopping district, cultural attractions, and the city’s central financial area. As with all Andaz hotels around the world, Andaz Tokyo Toranomon Hills will create inspiring experiences and offerings that incorporate the city’s rich history and culture, helping guests to know their surroundings more intimately and leave feeling like a local. 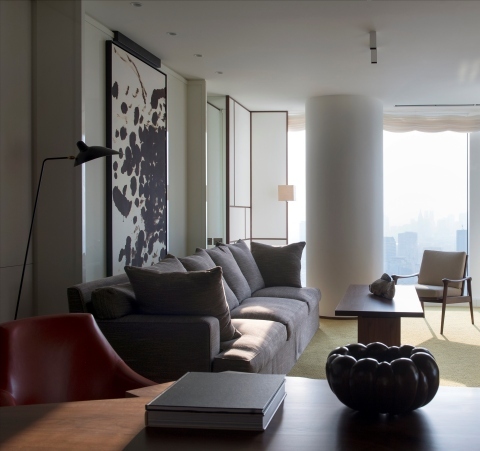 Designed by renowned interior designers Tony Chi of New York and the Tokyo-based Shinichiro Ogata , Andaz Tokyo Toranomon Hills reflects Japan’s cultural emphasis on beauty and purity of form by using natural materials such as washi paper and walnut throughout each space. The Japanese penchant for authenticity of material and textures translates to simple, yet sophisticated interiors where guests can both energize themselves and unwind at ease. The hotel features 164 spacious guestrooms, including eight suites, averaged at 540 square feet for standard rooms, with unparalleled views of the Tokyo skyline. The bathroom is a key feature of the room design, equipped with deep soaking tubs inspired by Japanese bath culture. In true Andaz fashion, all non-alcoholic mini-bar drinks and locally-inspired snacks are complimentary, as are local telephone calls and wireless Internet access, making a stay at Andaz Tokyo Toranoman Hills as seamless and barrier-free as possible. The hotel has assembled an array of restaurants and bars to showcase Japan’s vibrancy and deliver unforgettable dining experiences by utilizing fresh, seasonal and local produce. In a dramatic setting on the 51st floor is the main dining venue, Andaz Tavern, with 16-foot floor-to-ceiling windows offering stunning views of the city. Striking wood sculptures by UK artist Charlie Whinney hang from the ceiling, punctuating this stylish, contemporary space with energetic vibes. The menu features refined European provincial cuisine prepared with seasonal Japanese ingredients, offering uncomplicated and wholesome dishes with simple flavors. Crowning the hotel on the rooftop of the 52nd floor, the Rooftop Bar is part of a modern take on a Katsura Rikyu villa, the quintessential example of Japanese architecture. Re-envisioned from the image of a traditional Japanese teahouse, the design of the Rooftop Bar reflects the essence of Japanese life philosophy. The main area of the bar is separated into three different spaces with a variation of ceiling heights, providing the right ambience for each guest’s personal taste. The drink menu features crafted cocktails infused with premium teas and fresh seasonal fruits, domestic draft beers, premium champagnes and fine sakes. The space also offers an outside open-air, roof-protected terrace overlooking Tokyo Bay. Guests and residents from the neighborhood can also enjoy the Andaz flavor on the street level with BeBu, a casual, all-day eatery serving burgers and local draught beers, as well as the Pastry Shop, which offers fine patisserie, simple savories and premium coffee selections for eat-in or takeout. Andaz Tokyo Toranomon Hills offers 8,200 square feet of distinctive social spaces with fluid layouts and functional design, creating environments that dissolve barriers and encourage interaction and conversation. Six Andaz Studios are located on the 51st floor and are fitted for smaller customized events or business meetings. They include a Chef’s Studio, which is a flexible event space featuring a show kitchen ideal for intimate social or family gatherings, as well as the Tokyo Studio, which provides expansive views of the city in two directions. The Rooftop Studio on the 52nd floor features a theatrical show kitchen and open-air terrace, bringing alfresco dining and entertainment to new heights in the city. The 52nd floor also features a stand-alone chapel, the highest in Tokyo, offering breathtaking views of the city. It is designed with the same copper roofing and shingling of a traditional Shinto shrine and temple, offering a perfect venue for weddings. Andaz Tokyo Toranomon Hills offers over 14,500 square feet of leisure and recreational facilities on the 37th floor with its AO Spa & Club, which includes a 65-foot swimming pool, a unique carbonated bath, a floating jet bath, a full range of advanced fitness training machines, and five spa treatment rooms. Overlooking the spectacular Imperial Palace grounds and featuring extensive bath and water experiences, the AO Spa is designed with fluidity in mind, restoring flow and optimizing personal wellness amidst the chaos of everyday life. Rooted in each guest’s personal spa style, AO Spa offers a tailor-made treatment approach called JIYUJIZAI, a Japanese term meaning “your creation.” Through a combination of seasonal elements and high technology, JIYUJIZAI addresses the individual needs of each guest at the hotel’s Blend Bar. Reflecting the indigenous botanicals of Mount Fuji and surrounding areas, the Blend Bar features a wide variety of fresh fruit, fresh and dry herbs and natural minerals such as salt and clay. Being mindful of the environment, AO Spa follows the philosophy of “farm to table,” sourcing many ingredients from local companies. Recognizing the demanding lifestyle in Tokyo, AO Spa is introducing a high-performance, immediate results oriented European skincare line, Natura Bisse . AO Spa is the first and only spa in Tokyo to offer this revolutionary treatment. As with all Andaz hotels around the globe, Andaz Tokyo Toranomon Hills creates inspiring experiences and offerings through the Toranoman neighborhood’s rich history and culture, helping guests to know their surroundings more intimately and leave feeling like a local. Toranomon serves as a bridge linking the past and future of one of Asia’s most dynamic cities. Passionate and knowledgeable Andaz Hosts will go beyond the typical concierge role to share inside knowledge and tips about the capital and its famous new/old duality. Connecting with the city in ways that are attuned to their own interests, first-time and repeat Andaz visitors will be able to enjoy a deeper and more meaningful experience of Tokyo. Reservations for Andaz Tokyo Toranomon Hills may be made by visiting the hotel’s website or by calling a Hyatt Worldwide Sales Centre. Visit Andaz Tokyo Toranomon Hills on Facebook at http://www.facebook.com/andaztokyo. To learn more about the neighborhood of Andaz Tokyo Toranomon Hills, click here. Andaz Tokyo Toranomon Hills, Tokyo’s newest lifestyle boutique-inspired hotel, opens its doors in the Toranomon area, one of Tokyo’s oldest districts and now a key central area located between the Imperial Palace and Tokyo Tower. Housed on top floors of the 52-story Toranomon Hills, all of the hotel’s 164 rooms, including eight suites, enjoy breathtaking views over the city. The hotel features an array of restaurants and bars, including the Andaz Tavern and Rooftop Bar, unique events and wedding venues, its signature AO Spa, and a fully equipped 24-hour gym. The space is designed by Tony Chi and Shinchiro Ogata, reflecting a modern view on Japanese style and culture. Andaz Tokyo Toranomon Hills also showcases a series of local, cultural events through the Andaz Salon program and is dedicated to creating a stage where creative minds can come together, explore, learn and share. For more information, visit www.andaztokyo.com, or call +81 3 6830 1234. Global in scale while local in perspective, Andaz hotels deliver an innovative hospitality experience and attentive, uncomplicated service designed to accommodate guests’ personal preferences. Hotels in this collection reflect the unique cultural scenes and spirit of the surrounding neighborhood and are dedicated to creating natural and vibrant living spaces where travelers can indulge their own personal sense of comfort and style. Twelve Andaz hotels are currently open: Andaz 5th Avenue and Andaz Wall Street in New York, Andaz San Diego, Andaz West Hollywood, Andaz Napa, Andaz Savannah, Andaz Maui at Wailea, Andaz Peninsula Papagayo in Costa Rica, Andaz Liverpool Street in London, Andaz Amsterdam Prinsengracht, Andaz Xintiandi, Shanghai and Andaz Tokyo Toranomon Hills. For more information, please visit www.andaz.com. Hyatt Hotels Corporation, headquartered in Chicago, is a leading global hospitality company with a proud heritage of making guests feel more than welcome. Thousands of members of the Hyatt family strive to make a difference in the lives of the guests they encounter every day by providing authentic hospitality. The Company's subsidiaries manage, franchise, own and develop hotels and resorts under the Hyatt®, Park Hyatt®, Andaz®, Grand Hyatt®, Hyatt Regency®, Hyatt Place®, Hyatt House®, Hyatt Zilara™ and Hyatt Ziva™ brand names and have locations on six continents. Hyatt Residential Group, Inc., a Hyatt Hotels Corporation subsidiary, develops, operates, markets or licenses Hyatt Residences® and Hyatt Residence Club®. As of March 31, 2014, the Company's worldwide portfolio consisted of 554 properties in 47 countries. For more information, please visit www.hyatt.com.